The global demand for fluid transportation such as water, wastewater, petroleum, and oil and gas products are increasing primarily due to the increasing population. The transportation of these fluids is ever more dependent on pipelines for safer distribution & low environment impact. These pipelines are made up of metals, plastic, cement, asbestos, and such materials and are installed as per the required end-use, pressure of fluid flow, etc. Water distribution and wastewater management are more prevalent in the urban space and around 54% of the world’s population lives in urban areas. As increased urbanization and wastewater discharge go hand in hand, pipeline infrastructure has to accordingly be expanded. On one hand, there is increasing addition in pipeline network across the globe; on the other hand, existing pipelines cannot be interrupted. In this case, pipelines are tapped to add a connection to existing pipelines. This tapping procedure is done by installing a tapping sleeve around the pipe. This tapping sleeve is connected with a tapping valve and upon the tapping valve a tapping machine is attached to drill the pipe. This tapping machine advances through the tapping sleeve and valve to cut the pipe wall using an extendible shaft. Transparency Market Research analyses the global tapping sleeves market in terms of value in US Mn and volume sales in terms of ‘000 units. The global tapping sleeves market is expected to reach around US$ 2,975 Mn by 2026. The tapping sleeves market is expected to grow in terms of volume sales with a CAGR of 4.0% during the period 2016-2026. The North America tapping sleeves market incurred the highest market share, accounting for US$ 584.3 Mn in 2016. Global tapping sleeves market dynamics are subject to factors mainly related to the increasing pipeline network across the globe for various applications such as water, wastewater, and oil and petroleum products. Globally, there is an increasing water scarcity due to factors such as physical shortage, institutional failure of supply, or lack of necessary infrastructure. Countries with uneven distribution of water resources are increasingly depending on water distributed through pipeline networks. Accordingly, governments along with private investment are increasingly involving in new pipeline projects to transfer water from long distances, even from cross boundary countries. This pipeline infrastructure has to be well maintained and expected to operate without interruption or stops. Moreover, additional pipelines are to be installed without interrupting the flow of the water current. Accordingly, tapping sleeves are witnessing increased sales due to new construction of pipeline networks especially in developing countries. One of the main challenging factors impacting the growth of the tapping sleeves market is the intense competition from local unorganized tapping sleeves manufacturers. The tapping sleeves market is fragmented with the presence of a large number of players. A major restraint to the expansion of the tapping sleeves market is the stiff competition from local unorganized manufacturers to the established manufacturers. Tapping sleeves being produced by local manufacturers are offered in the market at a lower price than the prevailing price levels in the market. Countries in Asia such as China and India have a large number of unorganized local tapping sleeves manufacturers. Global manufacturers are focusing on entering emerging countries such as India and China. However, the presence of a large number of unorganized tapping sleeves manufacturers is projected to create a hindrance to the entry of new tapping sleeves suppliers in these emerging markets. Increase in the number of unorganized vendors of tapping sleeves has had a significant impact on pricing differentiation in the tapping sleeves market. For instance, a major area of focus for unorganized tapping sleeves suppliers in China has been competitive pricing. These suppliers have now turned their attention to the Europe and North America tapping sleeves market, which they plan to penetrate through local distributors. One of the opportunistic markets for tapping sleeves is from the wastewater systems industry. According to the United Nations Organization’s report published in March 2017, 80% of the world’s wastewater is released into the environment untreated. The alarming consequences related to untreated wastewater have raised the demand for wastewater treatment plants across the world. Water waste systems are built to collect the wastewater generated by residents, industries, and businesses, and process the wastewater into outflow that meets the state and federal water quality standards. Optimum water treatment systems and valves are employed to make wastewater plants technical marvels. A number of tapping sleeves are utilized in wastewater treatment plants over the years. Tapping sleeves are installed in water treatment plants to prevent the flow of water while the pumps are not in operation. Countries around the globe are optimizing water treatment plants. In 2014, Germany had 3,951 wastewater agglomeration plants with a capacity of 146,224,508 p.e. Rising number of water treatment plants across the world has propelled the adoption of tapping sleeves in the wastewater treatment sector. Some application areas of tapping sleeves in water treatment plants include water faucets control, flow control, and flow distribution. Increase in application areas of the water treatment sector has created a space for usage of tapping sleeves in various verticals of the water and wastewater treatment sector. Some of the key players profiled in the global tapping sleeves market are Mueller Water Products, AMERICAN (American Cast Iron Pipe Company), The Ford Meter Box Company, Inc., PowerSeal Corporation, JCM Industries Inc., Everett J. Prescott, Inc., Romac Industries, Inc., Robar Industries Ltd., Petersen Products Co., and UTS Engineering. The tapping sleeves market is segmented as below. The tapping sleeves market report provides analysis for the period 2016–2026, wherein 2018 to 2026 is the forecast period and 2017 is the base year. The report covers all the major driving factors and key trending topics impacting the tapping sleeves market growth over the forecast period. It also highlights the restraints and opportunities expected to influence the market during the aforesaid period. 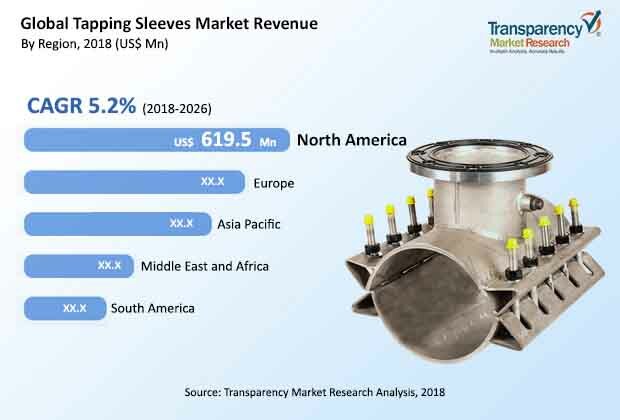 The study provides a comprehensive outlook on the tapping sleeves market’s growth throughout the forecast period in terms of revenue(in US$ Mn) and volume (Thousand Units), across different geographies, including Asia Pacific, South America, North America, Europe, and Middle East & Africa (MEA). The report covers the entire overview of the market including the market dynamics such as drivers, restraints, and opportunities and trends that are predicted to leverage the existing nature and prospective status of this market. The relationship between diverse industries is explained under the ecosystem analysis. Furthermore, the several internal and external factors affecting the tapping sleeves market are studied through the industry SWOT analysis The competitive position of the tapping sleeves market are studied through the Porter’s Five Forces Analysis. Additionally, current indicators of diverse macro-economic factors are contextualized under key market indicators. The tapping sleeves market has been provided in (US$ Mn) in terms of revenue and (Thousand Units) in terms of volume as well as the CAGR (%) for the forecast period 2018 to 2026. The tapping sleeves market is a global report studied on the basis of material, inches, fluid motion, application, and region. Additionally, under the regional sections, the price trend has been incorporated to ascertain the regional impact of the same. The incremental opportunity analysis has been figured out in order to determine the most attractive segment in the upcoming years. The report covers cross segmentation of materials by inches and applications by inches. This cross segmentation is covered for all the regional chapters including regions such as North America, Europe, Asia Pacific, Middle East & Africa, and South America. This cross segmentation data is intended to furnish the top potential inch range segment across the diverse material type and applications. The report also highlights the competitive landscape of the tapping sleeves market, thereby positioning all the major players according to their geographic presence and recent key developments. The comprehensive tapping sleeves market estimates are the result of our in-depth secondary research, primary interviews, and in-house expert panel reviews. These market estimates have been analyzed by taking into account the impact of different political, social, economic, technological, and legal factors along with the current market dynamics affecting the tapping sleeves market’s growth. Besides, competition matrix and market share analysis has been included under the competitive landscape to understand the top players’ contribution in the tapping sleeves market. Each company is studied on the basis of basic information, financial highlights, revenue highlights of regional contribution and segment contribution, and product portfolio. Additionally, the company strategy and recent developments if any are also incorporated under each company profile section. The global tapping sleeves market report has profiled the top players having a global presence such as Mueller Water Products, AMERICAN (American Cast Iron Pipe Company), The Ford Meter Box Company, Inc., PowerSeal Corporation, JCM Industries Inc., Everett J. Prescott, Inc., Romac Industries, Inc., Robar Industries Ltd., Petersen Products Co., and UTS Engineering.